Nobody seems able to work up much excitement over Alfred Hitchcock's Stage Fright, not even critics who can find something to drool over in all of his pictures. Although there's a lot of discussion about its famous 'lying flashback' sequence, it is a rather uninteresting murder mystery with some cute peripheral characters. But most of the humor is forced and the main dramatic setup too pat to generate the usual Hitchcock thrills. Jonathan Cooper (Richard Todd) confesses to his girlfriend actress Eve Gill (Jane Wyman) that he's been seeing another woman, famous actress Charlotte Inwood (Marlene Dietrich) and has just helped Charlotte conceal her husband's murder. Eve hides Jonathan at the seaside house of her father, the Commodore (Alastair Sim) and sets out to help clear the young man, meeting detective Wilfrid Smith (Michael Wilding) while pretending to be a replacement dressing maid for Ms. Inwood. Things go well until, instead of hoodwinking the young detective, Eve falls in love with him. An innocent man runs from a crime and his sweetheart becomes a junior spy to exonerate him, taking on false identities and playing her own cat & mouse games with the police as if she were Nancy Drew. All that separates Stage Fright from an ordinary whodunnit is the exemplary English cast, where meaningless bit parts are played by charming nutty types like Joyce Grenfell. Jane Wyman spends a lot of the movie pretending to be a drab maid, but the unhappy look on her face is a constant that makes her Eve a less-than-appealing heroine. She's not a very bright one either, in a script that makes both her and her accomodating father (he jumps willingly into her flaky accessory-after-the-fact scheme) look like dolts. The grouchy recipient of their goodwill has already lied to Eve and himself seems quite the chump falling for Marlene Dietrich's transparently wicked machinations. All of them deserve worse than they get, except for Todd's Jonathan, who pays too dearly. The possible romance angle fares better, with the charming Michael Wilding in rather good form. Yet there's still no chemistry between him and Wyman; nothing in the story gels. I'll bet that if Hitchcock found the play Dial M for Murder around this time, he wished to heck he had a story one tenth as clever. As if to compensate, Hitchcock fills the picture with his idea of comic relief - little bits of inane verbal comedy, mildly suggestive jokes and colorful 'English' characters like the overly familiar Miles Malleson and the above-mentioned Joyce Grenfell. Sybil Thorndike's comic playing opposite Alastair Sim is certainly well done, but it and all the other trimmings are irrelevant filler. As if bored, Hitchcock entertains himself with trick shots like a car accelerating apparently right into the camera - a gag probably done with a mirror. This is the film with Hitchcock's self-confessed biggest mistake, the lying flashback. (spoiler ahead) As soon as the film starts we rush into an awkward flashback that later turns out to be a complete falsehood. Instead of taking it as a lie by a dishonest character, audiences understandably feel cheated. Hitchcock wanted to give film language the same flexibility as a novel - if people can lie, why can't his camera? But visual conventions are naturally literal; viewers don't normally screen flashbacks for subjective inconsistencies. They instead think they're being given privileged information. If you show a cow on in a scene, you'll have a hard time later explaining that a character was just thinking of a cow. Hitchcock tried to lick the problem again in I Confess, but still didn't get it right. A film needs to visibly switch gears to present different 'tenses,' something that art films and post-modern screenplays now feel the need to do all the time. Hitchcock wanted complexity but also didn't want to alienate his audience or leave them in confusion. He couldn't have it both ways. Anyone defending the rest of the film has to contend with hackneyed ideas like the doll with the bloodstain or the 'hidden microphone confession' in the theater, stuff that's way below Hitchcock's ability level. He must have been marking time waiting for material that got his juices flowing. 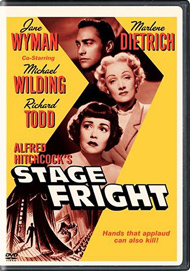 Warners' DVD of Stage Fright is also no looker. The transfer is okay but marred with rather prominent scratches here and there. The most obtrusive ones interrupt Marlene Dietrich's sultry song numbers and mar the last few shots in the show. The docu is short and light, with Peter Bogdanovich finding things to talk about other than the merit of the film. Richard Schickel sidesteps actually coming out and calling the lying flashback a failure, and others try to put the best face possible on things. Jane Wyman appears in an old Turner interview with a Dietrich anecdote. The rising of the stage safety curtain as a stylized opening is mentioned as a clever device, but nobody notices that it's this same curtain which bisects the villain for the film's vindictive conclusion.